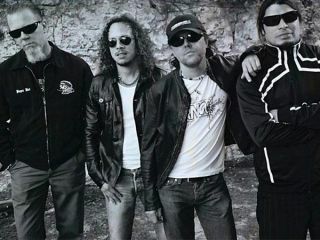 Would Metallica tour with Guns N' Roses? Lars Ulrich: "of course, we never say no"
Being inducted into the Rock And Roll Hall Of Fame is a real honour, but it has its drawbacks. Cue Metallica being put through their paces at what will surely be one of many 'welcome to the Hall' press conferences. Journalist: "On the topic of drama and tragedy, would you guys ever consider touring with Guns N' Roses again now that they're back out there?" Drummer Lars Ulrich actually shakes his head and mouths "no," before becoming a bit more diplomatic: "As James was saying earlier 'we're road dogs and we love to tour' so if that opportunity ever came in the right situation, of course." James Hetfield adds: "We've learned to never say never because you don't know what hurdle or what great thing is going to be handed to you." "Actually, all four of us really like Chinese Democracy," continued Ulrich. "I think it's a great record. Who knows, we never say no to anything." Finally guitarist Kirk Hammett chips in with: "I think the question is would they tour with us?" You can watch the full conference right here. Lars Ulrich already offered to join Deep Purple (to which Jon Lord politely refused) earlier this year, so an offer to tour with Guns N' Roses doesn't sound too outrageous. But would Metallica allow 'Guns to headline? Unlikely. Would Axl Rose warm-up for anyone? Not a chance.